Yankee Travel Club right now. $10 for one year! Yes, I want all the New England content Yankee has for a low introductory rate. Please provide your contact information. Fields with asterisk (*) are required. Please provide your payment details here. To order by phone please call 1-800-288-4284 and use code YANKEE to get this special offer. 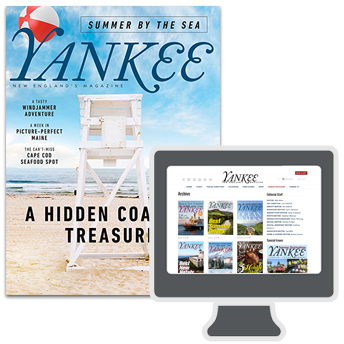 All-Access Membership Details: You’ll receive instant access to the online Yankee Library of more than 85 issues—including the current digital issue—more than 1,500 articles, and 7,500+ gorgeous photos. Plus, you’ll get the next year’s worth of 6 print-edition issues of Yankee Magazine, delivered right to your door. Continuous Service Satisfaction Guarantee: If I wish to continue with Yankee after the introductory period, I may continue at the guaranteed lowest available renewal rate. I may cancel at any time and receive a complete refund on any unserved balance of my membership. My satisfaction is always 100% guaranteed.